Tammy Yee's easy print and fold origami, crafts and educational articles make learning fun! Paper folding instructions, diagrams and craft ideas for the holidays. 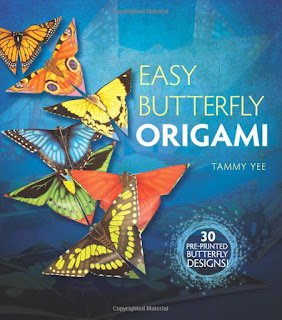 My new book, Easy Butterfly Origami features 30 bold full-color patterns designed to accurately portray the dorsal and ventral sides of some of the most beautiful butterflies from around the world! Print and cut out patterns carefully. Fold with clean, dry hands. Follow the instructions. Study the diagrams and be patient. Be precise: fold each crease well, flattening the creases by running your fingertip over the fold. Folding the paper away from you is easier than folding towards you. Be creative...use your origami on greeting cards, holiday decorations, table place cards and bookmarks. 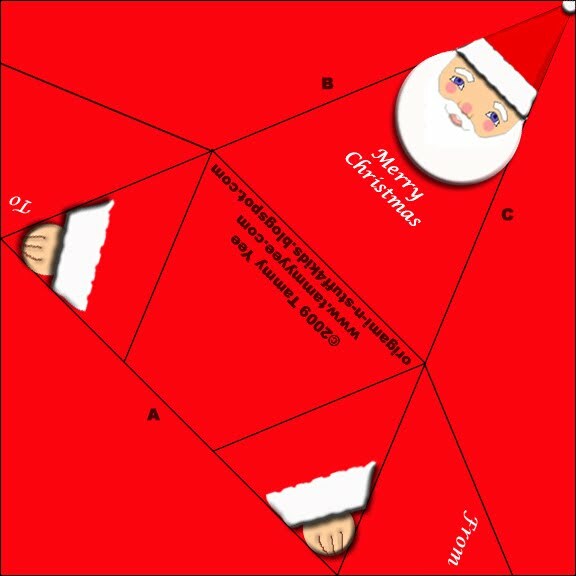 Print and fold an Origami Santa to use as a gift tag or a Christmas card. 1. Print and cut out Origami Santa along outer solid lines. 2a. With printed side facing down, fold up on line A. 2b. Fold diagonally on line B. 2c. Repeat diagonal fold on line C.
2d. Fold Santa's body up as shown. 3a. Turn Origami Santa over, with printed side facing up. 3b. Fold Santa's arm down as shown. 3c. Repeat on other side, and your Origami Santa is finished!